Multiple smaller dragons flying up to re-ignite the sun. 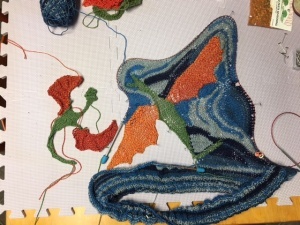 Dragons knit from orange-red yarn for wings, and green yarn for body. Background in the sock yarn from Paton. Back view. The eclipsed sun is on the left shoulder. 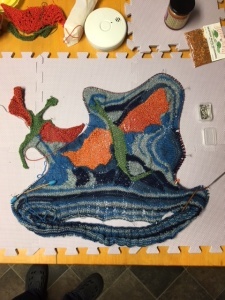 In this shot, I have started to connect the dragon to the main body of the sweater using short rows, and have filled in around the left hand wing of the larger dragon. 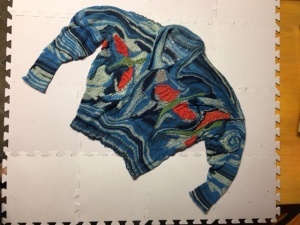 In essence, the piece is worked in this fashion, doing the front and back separately and leaving openings for the sleeves and the neck. 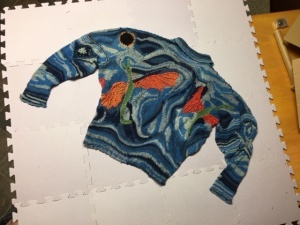 There are 5 dragons and the eclipsed sun in the final sweater.